UPDATED: Sun., Nov. 12, 2017, 6:58 p.m.
MIAMI – The arrival of more than than 130,000 Puerto Ricans in Florida since Hurricane Maria has some officials anticipating a political shakeup in a battleground state dominated by the Republican party. Both parties are actively courting new arrivals to Florida, which President Donald Trump won last year by 112,000 votes out of 9.6 million cast. Many Puerto Ricans have expressed outrage over Trump’s handling of the storm but have applauded efforts by Republican Gov. Rick Scott to welcome them. As U.S. citizens, Puerto Ricans can vote in federal elections when they move to the mainland. Newcomers must register as voters by next July 30 to vote in primaries ahead of the 2018 general election of a new governor to replace term-limited Scott and choose Florida’s congressional delegation. 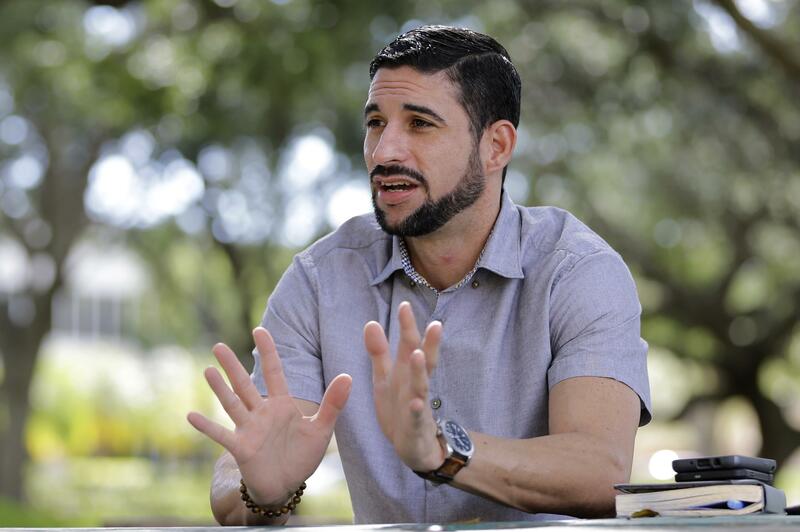 Javier Gonzalez has joined a human tide of more than 130,000 U.S. citizens arriving in Florida since Hurricane Maria wrecked Puerto Rico, grateful for a place to start over but resenting how their island has been treated since the disaster. More than a million Puerto Ricans – about 5 percent of Florida’s population – already call the state home, and given the outrage many feel over President Donald Trump’s handling of the storm, political observers say this voting bloc could loosen the Republican Party’s hold on this battleground state. Gonzalez, 38, saw the storm destroy the restaurant he opened with his father five years ago. Without power or reliable water, he became violently ill from food poisoning for three weeks. Finally, he packed his bags, determined to make his future in Miami instead. Like any Puerto Rican, Gonzalez can vote in all elections now that he’s moved to the mainland. He doesn’t plan to register for any party, but he follows the news and understands their platforms. He’s aware of Trump’s tweets. “It’s not right that we’ve fought from World War I, to Vietnam and Afghanistan and that the first thing the president says is: ‘You have a large debt, big problems and have cost us millions,’” Gonzalez added. Puerto Ricans are not the gift to the Republican Party that the anti-Castro Cuban diaspora has been historically. They’ve tended to favor Democrats, given their support for public education and social services. Around 70 percent of Florida’s non-Cuban Latinos voted for Hillary Clinton. Both parties are courting the new arrivals to Florida, which Trump won last year by just 112,000 votes out of 9.6 million cast. “There is an intent to grab those who are coming,” said Rep. Robert Asencio, a Democrat of Puerto Rican descent who represents Miami in the Florida House and leads the Miami-Dade Committee for Hurricane Maria Relief. “A lot of my colleagues say they are not politicizing this, but there is an effort to bring people either to the Democratic or the Republican side,” Asencio said. Newcomers must register by next July 30 to vote in 2018 for a new governor to replace term-limited Republican Gov. Rick Scott and choose Florida’s congressional delegation, now 11 Democrats and 16 Republicans. Democratic U.S. Senator Bill Nelson also defends his seat next year, and Scott, who has been applauded for helping evacuees, is expected to challenge him in what could be a close race. Scott set up three disaster relief centers to help arrivals with driver’s licenses, job searches, and disaster aid applications. Scott also asked education officials to waive public school enrollment rules for evacuated islanders, and to give college-bound evacuees the same tuition breaks state residents get. Asencio calls Scott’s actions “damage control,” given the multimillionaire governor’s close relationship with Trump, who offended Puerto Ricans by tweeting they wanted “everything to be done for them” rather than taking responsibility for their own recovery. They also resent Trump’s rating of his own disaster response as a “10 out of 10,” blaming his administration for delays that exposed their families to illness and misery. The island still faces a lengthy and painful recovery after the storm took down the entire electrical grid, leaving hospitals in the dark and closing schools for several weeks. Initial projections that 95 percent of the people will have power restored by year’s end now look optimistic. Maria’s evacuees are following waves of people frustrated by Puerto Rico’s unemployment and debt crisis who settled in Central Florida, shifting from New York, the favored destination of previous generations. Of the more than 140,000 islanders estimated to have left since the storm, more than 130,000 went to Florida, where Puerto Ricans may soon displace Cubans as the largest Latino group. State Rep. Rene Plasencia, a Republican from Orlando, predicts that Scott’s warm welcome will leave a bigger impression on the newcomers than any Trump tweets. Billionaires Charles and David Koch also are involved, funding the Libre Initiative, which welcomed hundreds of evacuees on the first cruise ship to arrive from San Juan. Cesar Grajales, who lobbies for Libre, says they’re helping evacuees learn English and connect with community and business leaders. Democrats hope Colombian-American Annette Taddeo’s recent underdog state Senate victory against a well-funded Republican in South Florida shows her anti-Trump message will keep resonating. On the island, Puerto Rico’s lack of statehood means they can’t vote in general presidential elections, and can only send a non-voting representative to Congress. On the mainland, they’ll have more power. Published: Nov. 12, 2017, 2:40 p.m. Updated: Nov. 12, 2017, 6:58 p.m.